Apple has won the right to patent the design of its stores in a landmark ruling in the European Court of Justice after Germany rejected the initial application. Germany, Europe’s largest market, rejected the computer giant’s application on the grounds that there was nothing unique about its stores’ layout, finding the request baseless. Apple appealed Germany’s ruling in the European Court of Justice on whether their stores’ design could be patented purely on their design qualities without any specific details on size and layout. The court ruled Thursday that Apple stores could establish a trademark based upon “integral collection of lines, curves and shapes” provided their design “departs significantly” from the norms of their competition within the sector. The court included the caveat that the uniqueness must be assessed on a case-by-case basis. The case is still to face Germany’s national court which will decide whether to rule in line with the pan-European court. 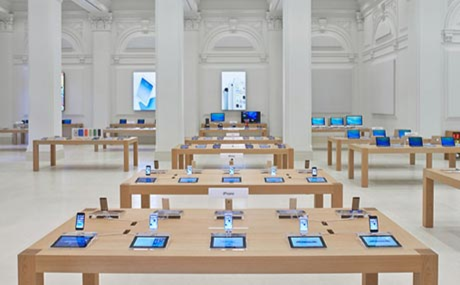 In 2013, the US accepted Apple’s patent request of its stores including its glass staircases, its shelving layout and its rectangular tables and stools. However, Apple’s Genius Bar — one of its stores’ defining features — was inspired by the Four Seasons hotel chains’ concierge service. Steve Jobs once remarked in 1996 that “good artists copy; great artists steal”, a phrase attributed to Spanish artist Pablo Picasso among others. It has long been accepted that Jobs stole the idea of the computer mouse after a visit to Xerox’s Palo Alto Research Centre in the mid ’70s. Apple has become increasingly hostile in relation to its copyright, taking rival Samsung to court in 2012 for infringing on several patents — which Apple won $1.05 billion in damages.